It was a great day at Road Atlanta! 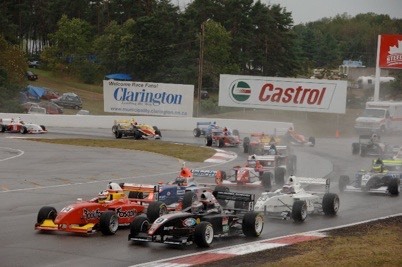 The Star Mazda Series has completed the 11th race of its 12-race season. Like many races this year, there was plenty of action. Let me now take you there. After my worst ever qualifying session leaving me to start the race 14th, I was wondering, how would this play out? Just what would I have to do to survive the first lap and move into contention? I had a few complications to consider, but it was time to race. As we came down the hill to the start/finish line, I finally heard Remi Lanteigne say in my ear, "Green green green!!" It was so typical, with cars already moving to 4-wide on the front straight. Most cars went to the right, so I gave the outside left lane a go for Turn 1. I brushed the brakes as softly as I could, went down an extra gear for the tighter line, turned in, and hoped nobody would punt me off into the grass. There's really not much I can do to avoid that! So, after a short prayer, I exited Turn 1, shouted with glee, and went for Turn 2. As I approached the half-way point of the first lap, my engine began to sit down. That's a term for no acceleration. I was certainly worried my race had just ended, but the engine then picked up and I could drive to the next corner. On the next straightaway, the engine sat again, causing me to slow down so much, two cars blew past me as if I was standing still. I was calling my engineer in rather animated tones and careful choice of words explaining how the engine was about to give up. I knew I had to continue no matter what, and Remi repeated the same sentiment on the radio. Know what happened next? The car just worked. No more sitting. We were back in the game despite losing those positions. As the race progressed, I first had to catch the guys I had lost. A few laps later and I passed Doug Peterson. Then I caught the comedic battle of Ryan Justice, Michael Potekhen, and Logan Gomez. These guys were fighting so hard, their lap times were almost two seconds off the pace. I got caught up in it, began to enjoy it, and played the game right along with them. I didn't much think the blocking games they were playing were really necessary. Why not just race and see who can drive the best? Instead of racing, I waited for a smart time to make a move. I lost a position, gained it back, then Logan got through and away. As I was going to finally pass Potekhen, he parked his car entering Turn 7 (extremely slow entry speed) for some reason, either mechanical or intentional, causing me to slam my brakes more than I needed, causing Doug Peterson who is behind me to slam his brakes, causing my teammate Brad Jaeger to slam into and over the back of Doug's car, sending them both off the road with damage. An instant later, Michael Potekhen's engine blew up, ending his day. Poetic. I passed easily. A few laps later I caught Ryan Justice. I wanted to pass him so badly. He's a really fast driver, and has been dominant at most races this year. We missed our chance to go into battle at Sebring when he was taken out at the start by another driver, so our battle was finally here. He gave me a nice block on the front straight one lap, but I learned my lesson and passed him on the outside of Turn 1. It was interesting, but doable. I was finally getting somewhere. 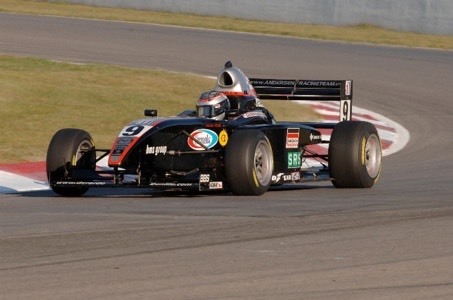 Later, I passed Dan DiLeo, a very experienced driver who almost won the Star Mazda championship in 2004. I was holding my ground well in 6th place, but on the last restart, I missed an upshift, and Dan was by. I was in 7th. I caught up to Dan once again, but just as I was making preparations for another pass, another crash occurred (ending teammate Phil Saville's day in Turn 11), causing a full-course yellow that would last through the checker. Our race was completed. We accomplished our goals. We ran fast, we passed Potekhen and Justice, moving us to 4th overall in the points standings. Our goal is to move up to 3rd at the last race, but Ryan will be tough to beat! Ron White is also closing in fast after winning three races in a row (somebody's gotta stop that guy!). Thanks again for hanging in there with me. Thanks also to all my guests for coming to the track to see me, including my parents, my younger brother and his family, Louise Mackay from Carmela Sausages, my cousin Papo and his family, and my good friend Laura Rowe. It was also great to see Michael Gomez, Susan Addison, Bob Cole, and other friends from the racing world. Thanks again to Dan Andersen and the powerhouse Andersen Racing Team for giving me a great environment to race. 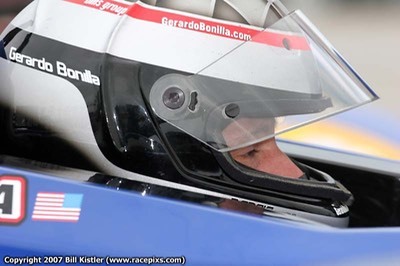 Thanks to the Skip Barber Racing School for helping me get here. And of course, thanks again and again to Skip Barber, Cornerstone Controls, Carmela Sausages, Automatic LLC, and my many investors for giving me the financial backing to keep this opportunity open. It would not be possible without you. I missed a day with my updates, so a short review. 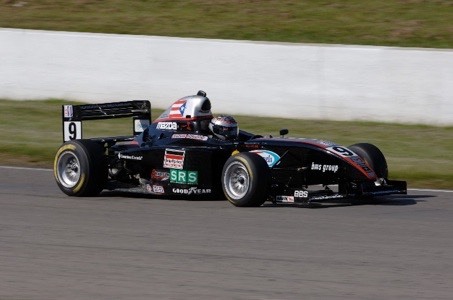 On Wednesday, the Star Mazda Series drivers participated in two practice sessions. The Road Atlanta track was sunny and dry thus we all found more speed. I had written about how satisfying it was to see the growth in what I could do in the race car over the last six months. Unfortunately, my competition has also gotten better behind the wheel! It's still quite hard out here! On Wednesday, we were 8th and 11th overall. In today's morning practice, we continued with our research and development. I continued to learn that it was in fact possible to drive faster, while my engineer Remi Lanteigne found near perfection with the car's setup. You could imagine our disappointment when we found ourselves 12th overall. Perhaps the hamsters in the engine were a bit tired. We replaced all the engine's consumables after that practice in hopes of a good qualifying this afternoon. Just minutes before the Qualifying session was to begin, and truly on cue, it began to rain! How fun! Well, I was certainly happy about the rain, but it proved to be a challenge for me. They gave us 30 minutes for all cars to qualify (no split session). Traffic was the usual busy, but visibility was especially poor to start out. To add to that, the track was unpredictable enough that it took me longer than usual to find all the slicker spots. No big deal, the speed will come, right? 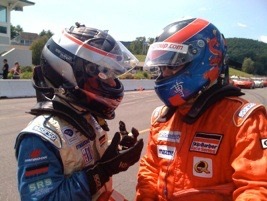 Well, the red flags came when our good friend and teammate Phil Saville made contact with the wall in the Esses. After the cleanup we had about 11 minutes to go. Everyone started going much faster. The rain had stopped and the track had begun a very slow drying process. Every single lap, the pole time was going lower and lower. By the end of the session, I had not noticed closely enough just how well the track was drying. This skill was a specialty of mine in the Skip Barber series. Apparently, I had to learn this process in the Star Mazda for the first time today. I missed the train, missed a few key dry spots that had poked through in the last couple of laps, and ended up 14th overall. It didn't feel good, but I've channeled that disappointment into focus for tomorrow's race. I am keenly looking forward to the battle that is coming. The wet qualifying shuffled the usual order enough that I should have plenty of stories for you in tomorrow's update. Until then, wish me luck! Thanks again for all the help and friendship you have all given me! I cannot say enough how much FUN this job is! 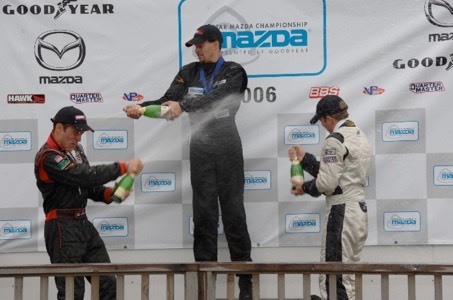 Being a race car driver has been one of the most fulfilling activities of my life. 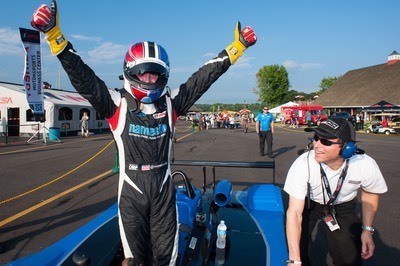 This recent surge of good feeling began last week when I was doing my other job, coaching the Skip Barber National Championship drivers at Road America. The drivers there put on a great show, as they usually do. But what made it special for me was to see them grow each day. I could see light bulbs lighting up over their heads as we talked about what they could do better. It's such a great life balance to be able to give back what I've learned when I'm not racing. I hope to be a part of the Skip Barber series in some form for a long time to come. Upon arriving in Atlanta yesterday I had a nice lunch with Laura Rowe. I hadn't seen her in six months, so a bite to eat was long overdue! Later in the day I was blessed to spend some time with the very young patients at Children's Healthcare of Atlanta at Eglestone. The Racing For Kids charity, originally created by race driver Robbie Buhl, arranged the meet and greet with the young hospital patients. Ryan Justice of the Northwest Autosport team was also there to sign autographs and hang with the kids. It was a beautiful thing. 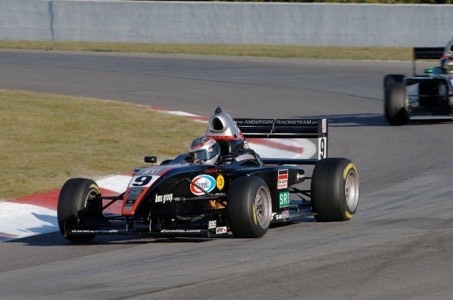 Today I was almost giddy as I got back into my Pro Formula Mazda racecar. It was great to see the Andersen Racing Team members again. My engineer Remi Lanteigne was ready for me the minute I walked up, wasting no time discussing our test plan for today. My lead mechanic Jim and his assistant Jake had my car all polished and ready to go. These guys are just great. We did three practice sessions today on the historic Road Atlanta road course near Braselton, Georgia. In the first session, the driving was mostly about getting the cobwebs out while surviving the slick surface that comes with colder morning temperatures. A couple of corners in particular were almost like driving on ice. Fun! We placed 7th in this practice. In the second practice I found more traffic on the race track than I did during the morning ride from the hotel. We placed 10th overall. Then, in the third session of the day, I pushed myself to new limits, sliding the car massively in the super fast Turn 1, until I could get it smoother. We finished this session in 4th overall. Smiles were percolating. Remi was pleased, although I was cautious. There are still guys who are faster than us, and I don't much like that! I find myself working harder than ever, but also understanding what I am doing better than I have all year. It's a beautiful thing to see your students grow when you teach. When you are working hard on your own personal learning, its harder to see the progress. Every once in a while you can tell you have achieved a new milestone. Today, I have felt a milestone that can only be found with experience. I am more aware of the most minute details, the most hard to notice chatters in the tires, or the fine characteristics of the asphalt. The driving is becoming more and more subconscious. And there is still a way to go, many cars to be raced, many tracks to be learned, many drivers to race with, and many many fans to entertain. More news tomorrow. Thank you all once again for helping me get here. I may be the guy taking a bit of risk in the car, but all of you took some real risk by sticking your necks out for me. Thank you so much. I was so close. It was a dream race, not unlike Sebring, only this time the competition was tougher. It was a gift, an opportunity to strengthen our momentum from Road America, and an opportunity to do what few can do, race well in the rain. It was a privilege. In Qualifying we were given one 45 minute session to do what we could. The rain had not yet arrived, so it was a barnburner dry session. During the first 15 minutes we hovered around the P4 position. The track was feeling okay, but not great. Then my radio crackles with the sound of my engineer Remi Lanteigne. "1:14.9 is the fastest lap Gerardo, go get it!" I was at 1:15.5 at that point. I was baffled. But then questions were answered as the track, like magic, suddenly became super grippy. Perhaps it had reached the right temperature, and we shot through the corners beyond the laws of physics. In two more laps I was running 1:14.7. "P3" crackles Remi on the radio. I did two more laps but could not go faster. It was time to pit. We later learned we'd start P2 when the original P2 driver was disallowed for a fuel irregularity. Okay. Just before the race was to begin, the rains came down. A smile was percolating on my stress ridden face. Could it be? Were we finally going to have a wet race? What would it be like? How much visibility would we have? Would I be able to find grip before everyone else does? All I could do was have faith that I could do it. I could have faith because I had been in this situation before and my instincts would put me in a good position. At 1:05 PM the green flag waved and off we went! I had a solid start next to points leader Adrian Carrio. We came over the crest and into Turn 1, my eyes squarely on the outside rain line, a soft brush of the brakes a bit early, slow hands, back to power, YES, that was fun! Where is Adrian? Not even in my mirror! Holy cow, LET'S GO!!!! I kept my research program going. Turn 2, oh my God, we can go THAT fast!??! Turn 3, oh geesh, $#@$@, man is that slick!!! Turn 4, careful... careful, whoa, that's grippy! Turn 5, oh oh oh oh geeeze, that's a horrible corner! NoGripAtTol!!! Turn 8, oh my, look at this grip!! Look at how fast this is! Turn 9, sweet, Turn 10, okay, good, next lap... FULL COURSE CAUTION. I bet we're going to have a lot of these! And so the race continued. A lap of green flag, watching the cars behind me disappear in the wake of my car, then another full course caution. Hey, its racing, its our first time in the rain, nobody had any practice, guys are going to make mistakes and bring out the pace car. A couple of times we went two laps before the pace car would rejoin. I think the pace car may have led the most laps, but I'll have to check the results. Finally, on the last restart, cars went off, but in places where we could continue racing under green. I pulled my gap again, but there were two new threats. Apparently, Charles Anti is really good in the rain, and better than I was at Turn 4 and 5. I knew I was weak there, but what time was there to experiment? I stuck with my gut, and drove the wet line. Charles went for a move on the dry line at Turn 5a and slid into me, spinning himself out, and knocking us sideways, but I didn't spin! I'm still in it! Next lap, a new threat. Ron White was behind and closing fast. It was now the last lap. My foot was shaking uncontrollably on the gas pedal. It was so tricky to get through Turn 1 and 2 at the proper speed with my foot losing focus. But, I just kept calling out what I had to do each corner. I trusted my strategy, same lines, same speeds, nothing special, but Ron had closed to within inches at Turn 5. We both were driving overexcited, both slid through Turn 5 poorly, and exited the corner together. He tucked in behind me on the straight. He could see nothing behind me except white water spray. As we finished the straight he had popped alongside. We flew into Turn 8 together, absolutely side by side. I could see the spokes of his wheels mere inches from my own. I couldn't believe I was there. I was fighting for a win, side by side with another good driver, in the rain, in a corner that's normally done flat out in 6th gear, here we are in the rain, still at about 100 mph, inches apart on an unpredictable track, what was going to happen next? Time stood still. Ron's performance through the corner was exactly four inches better than my own. It was enough that he could no longer see my cockpit next to his and he knew he could track out. I could have stayed there, but it would have meant car contact to push him back out of my way. The risk was extremely high we would both not finish the race. I couldn't accept that possibility, and let him through. I tried one more time in Turn 10 and closed to within 0.5 seconds at the finish line. My feelings then were of great pain and great joy all at the same time. Even now as I write, I am torn by great joy and pain. The pain of losing a great win in the last second is not pleasant at all, but the joy of losing it in a great battle, the joy of leading the entire race, the joy of performing so well in my first rain race with no rain practice, the joy of making my owner Dan Andersen happy, the joy of seeing Remi, Jim, Mike, Jake, and the rest of our great crew smile, the joy of 2nd place still being a great finish, the joy of interviews and spraying the champagne, all these joys far outweigh the burn I feel. Thanks again to the friends who passed the hat around last month and raised the money to send me here last week to test the race car in preparation for this race. Look at what a difference you made. 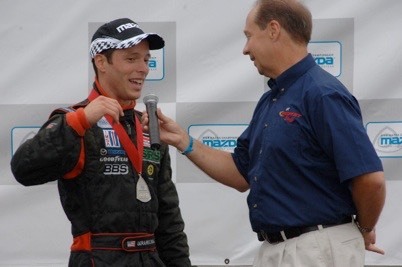 Thanks to Skip Barber Racing School for teaching me to race and helping me get here. Special thanks to Christian for your guidance and friendship. The deep respect you have shown me is one of the great marks in my life. More special thanks to Jean Claude for your sincere help. 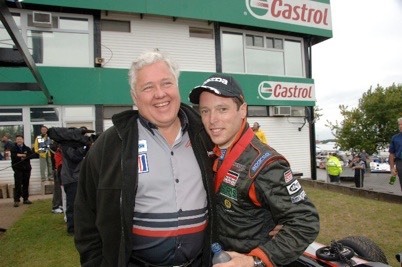 Thanks to Randy Pobst, my first racing hero, for stopping by to see me after the race. Thanks to SRS, Automatic LLC, Cornerstone Controls, Carmela Sausages, and my Investors. Thanks again to Dan Andersen for continuing to keep the faith. Thanks to my family for your love. I miss you. 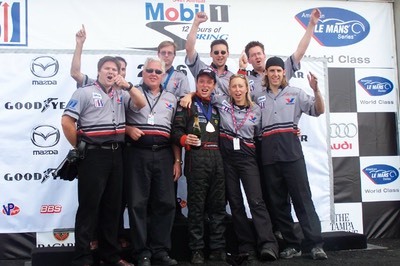 Our last two races are at Road Atlanta September 29 and Laguna Seca October 21. I hope to see you at the races. Wish me luck! First a bit of housekeeping. Yesterday I mentioned the Mosport race is Round 9 of 12. It is in fact Round 10 of 12, so three races to go including this weekend. Today we were to do two 45 minute practice sessions. Mosport is a track you must respect. Someone didn't get the memo out to the drivers, because we could only go a few laps before someone crashed bringing out the red flags. Near the end of Practice 1 we managed 11 laps in a row! Amazing! It was really fun, and once again, the car was feeling better and better. Now then, if we could just get more clear laps! We ended up 7th overall, not great, but not too bad considering the shortage of laps. In the second practice this afternoon, it was more of the same, only worse. The crashes were bigger, meaning longer red flag periods. I did three laps, then sat in the pits for quite a while, then did three laps, then another red, then a few more laps, then red. I lost count on how many reds there were. Then, just when I thought it was time to go back on track, checker flag. Oh boy. With only two flier laps in, we were 8th overall. Again, not wonderful, but we do have a solid car. The driver still needs a little help, and the help I thought I could get today was spent mostly sitting in the pits waiting on cleanups. That's racing. Tomorrow something amazing could happen. It might rain! We have not raced in the rain at all yet this year. 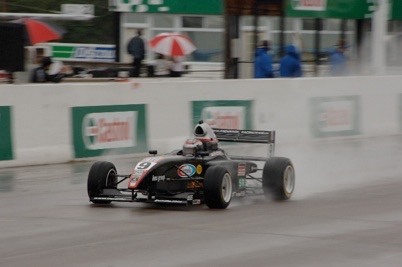 Last year in the Skip Barber National Championships I prayed for rain all year long, and got it only once, at the season opening race at Sebring. I have a hunch that with some rain tomorrow, great things could happen. Let's see, shall we? Thanks for hanging in there with me. It's quite the adventure, and quite the privilege to be racing.